This is part 1 of a 2 part series on church leadership. 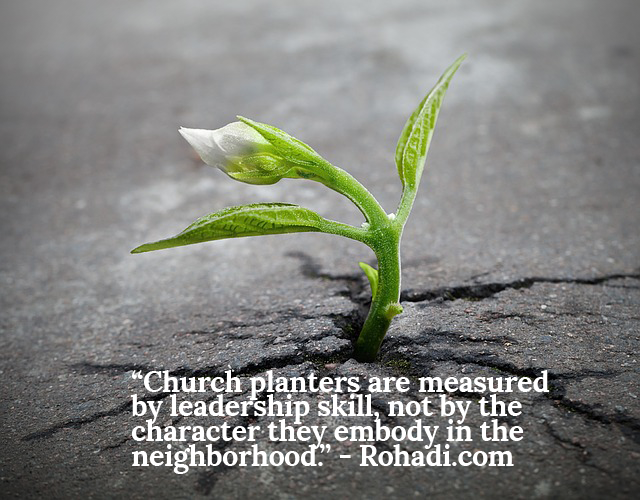 In this edition a look at the way we measure prospective church planters. There’s an unhealthy fascination with leadership development in churches that’s leading to a generation of leaders who are awesome managers but not very good disciplmakers. For example, the renewed interest in church planting has brought some interesting challenges around how we develop said church planters. Generally, most church planting development/coaching comes from para-church organizations comprised of various denominational members. As such, there’s a strict ‘brand’ of church planter that emerges from the established program. Most (not all) rely almost exclusively on leadership qualities as primary governing factors determining whether someone qualifies. There are many problems with this approach, chiefly among them, new church plants still aren’t very good at making disciples or interacting within a post-Christian culture. The problem is we’re creating future church planters/leaders to reiterate institutional paradigms–an institution that’s crumbling. We are in need of some alternatives. Almost all of church planting development relies on pouring resources into a single leader identified through various assessments. These assessments are measurement tools not based on someone’s capability to embody the Gospel in the neighborhood (although I surmise this could be A question among many others), but how well they can become future managers of church function. Since almost all church plants have largely the same identity as the sending church, the results are mere re-iterations of church expressions firmly planted in Christendom. These kinds of churches have passive worship services, lack any reproducible discipleship, and rely entirely on a critical mass of existing Christians to contribute to the function of the organization. They are, for lack of a better term, consumer churches. Consumer churches need competent leaders to man (literally) the helm because it’s understood the existence of the body depends on its delivery of the key worship service and specific programming. Finding the right leader to learn the trade and become the ‘leader of leaders’ provides the greatest chance of establishing a viable body. This isn’t particularly innovative, which is why the kind of church planting we do, and the kinds of leaders we build to lead them, look almost the same as the traditional institution. There’s nothing inherently bad with this process, it’s just become unfortunately ubiquitous. It’s also ineffective. Or rather, church plants that can last beyond year two are certainly effective in a sense they’ve managed to maintain their critical mass of existing Christians, but not effective at sending those Christians out on mission or deeper discipleship–the same problems the established mainstream church has. So although church transplanting is a viable way to start a new Kingdom expression, it has now become almost the de facto method for most church planting in an age where we desperately need different ideas. What we don’t see (albeit there are parish movements dotting the landscape that are picking up steam) are smaller networks of believers established in particular geography’s being developed because of their existing praxis and not their identified ‘leadership’ potential. Church planting, or Kingdom expressions, or whatever you want to call them, needs to take on a new shape, and step one will be walking away from the idea of leadership development as a central need. What I suggest instead is a holistic development of a group of people, anchored in a particular geography, gathered together because of their complementary giftings, who are already living the character of Jesus out in the neighborhood. Here we stand a chance, if we’re patient, to let the justice, beauty, hope, and love of the Kingdom, stretch beyond the safe confines of church walls, and into the neighborhood that so desperately needs reconcilers. Calling all rebuilders, stand and be accounted for. We will one day be restored.